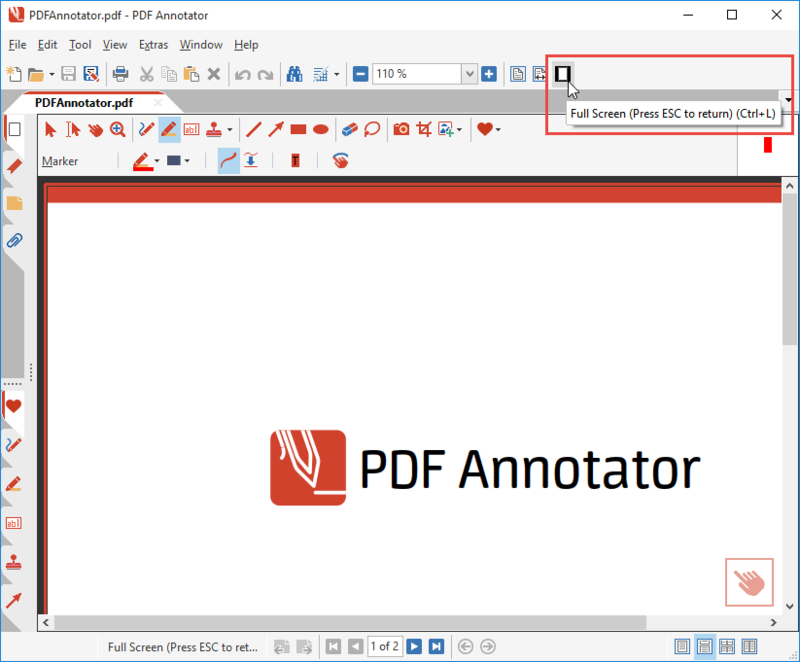 In PDF Annotator 6, we introduced a new Full Screen Mode that features a single toolbar, which can be customized extensively. The new toolbar features a set of Tool Buttons, as well as a set of Action Buttons. We already looked into customizing the Tool Buttons in another article. 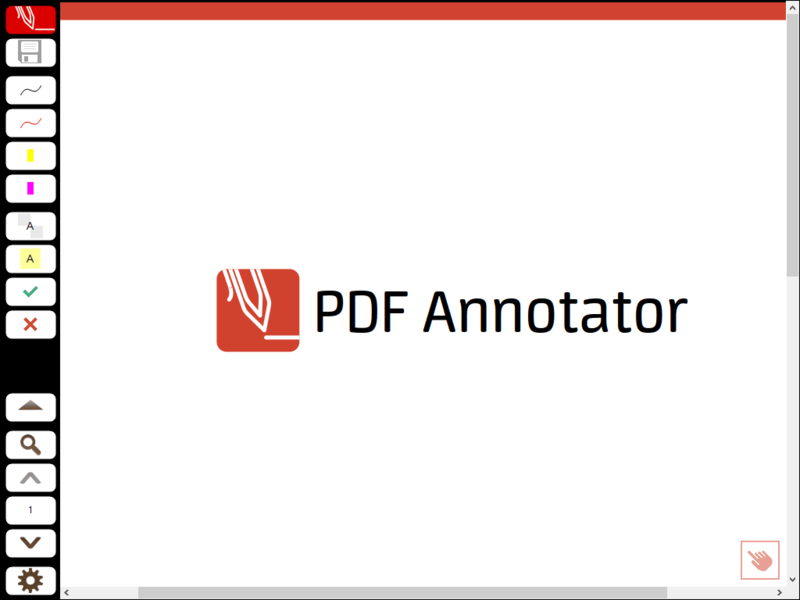 While Tool Buttons stand for your favorite tools, like pens, markers, text tools, and so on, Action Buttons can hold any other feature that is available in PDF Annotator through a menu command, such as Save, Print, Append Page and many more. Let's see how easy it is to customize an Action Button. 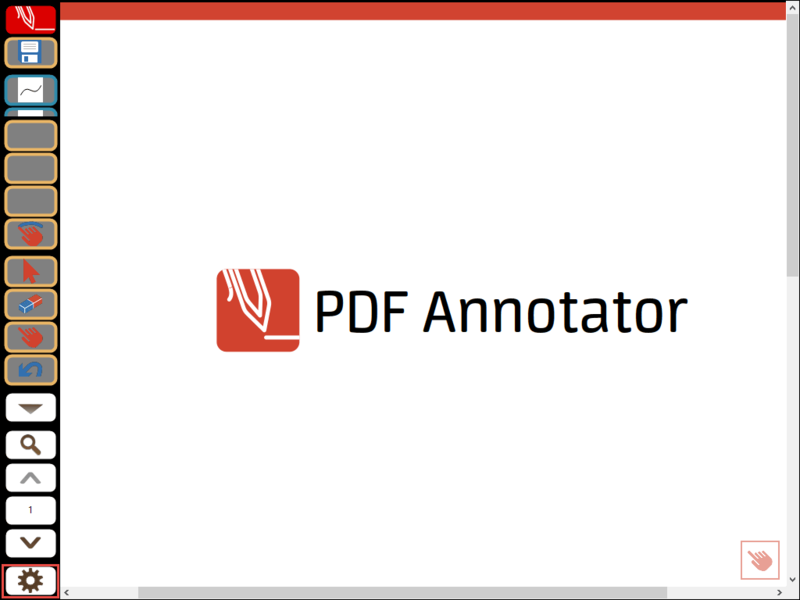 First, let's switch PDF Annotator into Full Screen Mode by clicking the Full Screen button in the toolbar, or pressing CTRL-L. Here's how Full Screen Mode looks like by default. You will notice the toolbar on the left. the Full Screen Menu button. one Action Button, that is by default a Save button. eight Tool Buttons that have been preset with two different Pen tools, two Markers, two Text tools, and two Stamps. the Customize button (the button with the gear icon). three Page Navigation buttons (to navigate one page up and down, and one button that displays the current page number, and provides more options when you click it). the Zoom button, which provides various zoom options when clicking it. an Expand button, which you can click to bring up more Action Buttons. To customize the Full Screen toolbar, we need to click the Customize button (the one with the gear symbol) to get into customization mode. On our screenshot above, you will notice that the Action Buttons, which would normally be hidden until we press the Expand button, now became visible. 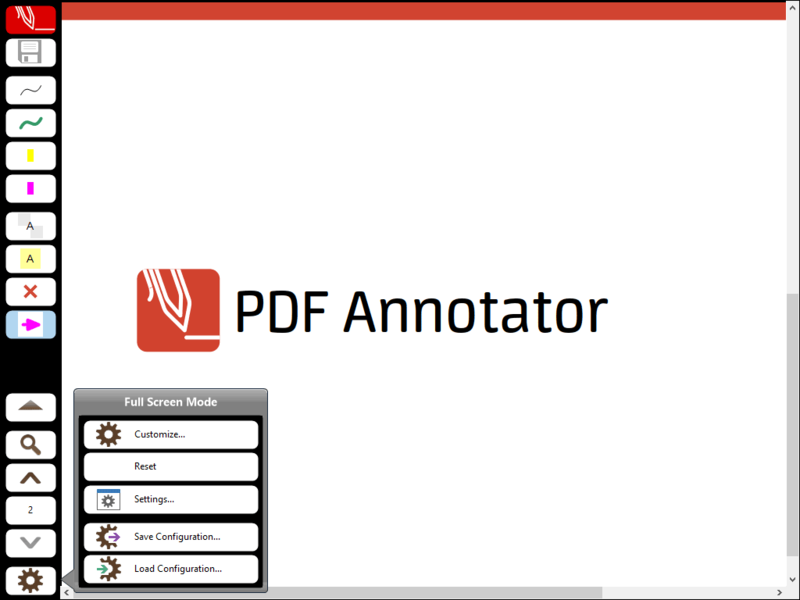 For taking the screenshots, we ran PDF Annotator on a very small screen, so there is not enough space for the Tool Buttons on the top, and the Action Buttons on the bottom to be visible simultaneously. The Action Buttons from the bottom overlay the Tool Buttons on the top. This will typically not happen on your (larger) screen. As you probably already noticed, in customization mode, Tool Buttons have a blue outline, while Action Buttons can be identified by an orange outline. Let's click one of the Action Buttons (with the orange outline) to customize it. We're going to choose one of the empty buttons, because we want to keep the predefined ones. This opens the Customize Command window. In the Customize Command window, we can now select a command for the Action Button. We can either start typing the command in the Find command... box, or just scroll through the list. 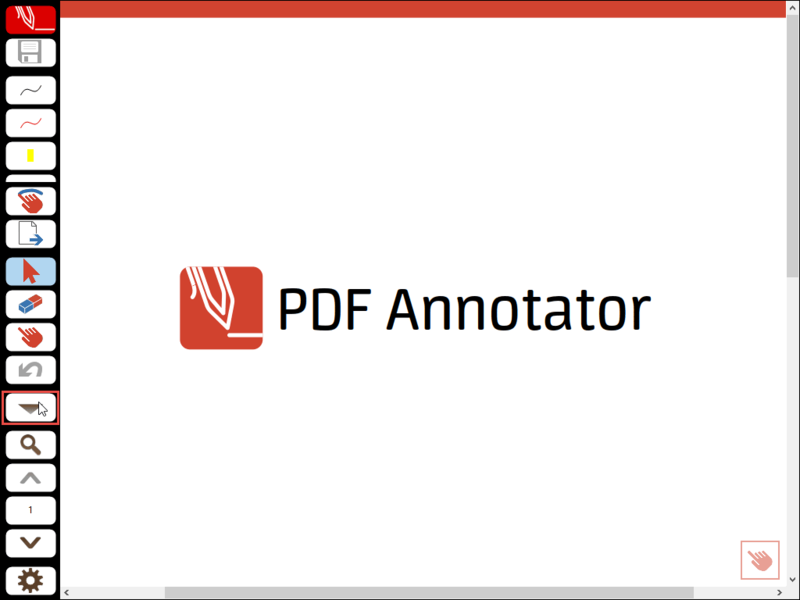 In our example, we're going to add an Append Page button. So, we start to type "Append" into the Find command... box on the top, wait a second for the list below to be filtered, and click the Append Page command. You will notice that the icon on the Action Button automatically updates when you change the command in the Customize Command window. You can do the same with any of the nine Action Buttons with the orange outline. We can move buttons up and down by clicking the up and down buttons in the Customize Command window. 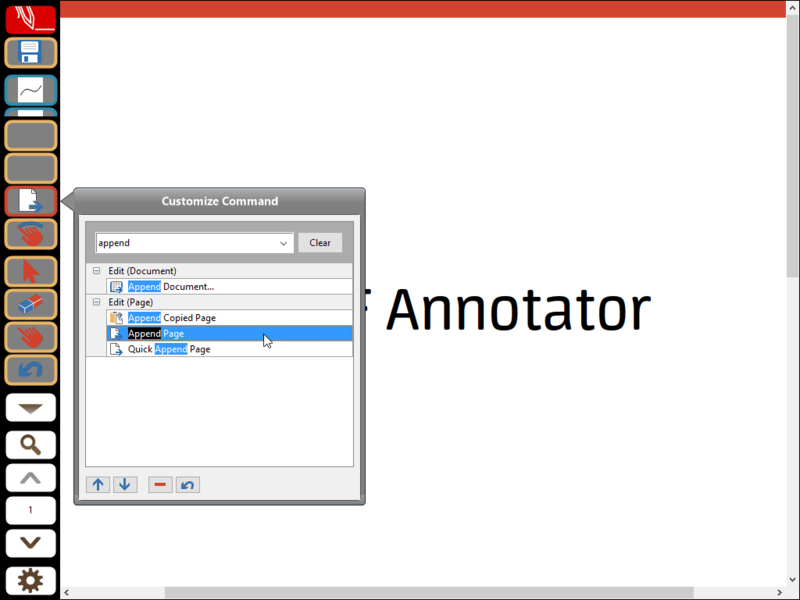 We can choose and set up one of the blank Action Buttons, which have not been associated to a command, and therefor have not been visible so far on the Full Screen toolbar. There's a maximum of 17 Action Buttons we can customize. If they don't all fit on the screen, we can scroll through the buttons with our finger (or using the arrow buttons, which appear if not all buttons are visible). We can click the Minus button in the Customize Command window to make a button blank again. It will then just show up as a black space on the toolbar. We can choose the Undo button on the bottom of the Customize Command window to get back to the command that was configured when we started customizing. Finally, when we click the Customize (gear) button again, we leave customization mode, and we're done! We just need to click the Expand button to display the Action Buttons. One more tip: When you right click the Customize button (the gear icon), you will find a number of options to choose from. 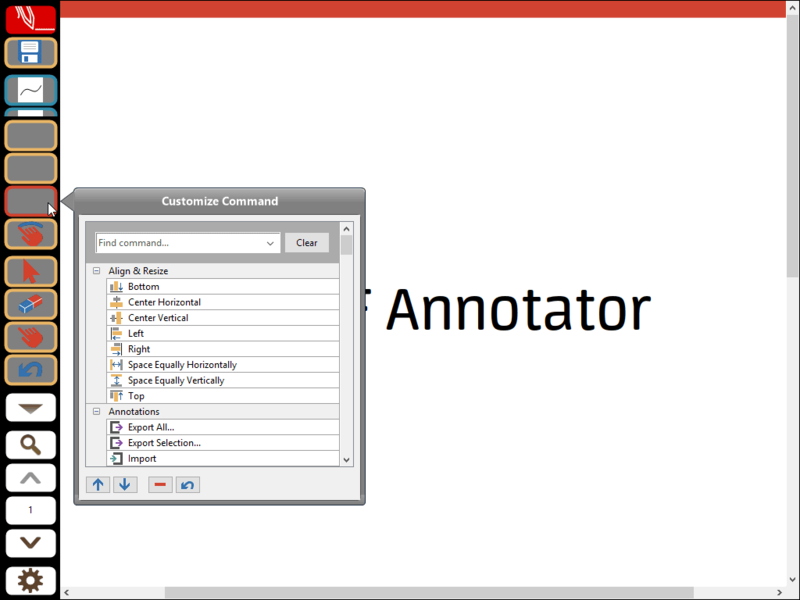 For example, we can Reset all customizations we just made, and get the Full Screen toolbar back to its factory defaults. This would discard all the changes we just made.